We have heard that if you're not sure if you will like kayaking then you should go to your nearest box store and buy the cheapest thing you can find. After all, why spend TONs of money on something you will "never" use? -We say don't bother... don't even buy a kayak at all. We have rentals and even FREE Try-Before-You-Buy at both our stores. Every day at Oak Orchard Canoe Kayak Experts we show people that have never even been in a kayak how much fun and how easy it can be... (or how disappointing it can be -depending on which kayak you try). YES, even beginners can feel the difference from one kayak to another. This is especially true at the low end, where spending just another $50 or $100 can provide twice the FUN. Come to our store and we'll PROVE IT. Just your basic Pelican kayak. 8ft kayaks are small and compact. Takes up very little space when not being enjoyed. available in our vibrant Boreal color. Featuring a large hatch with quick access bungee in the stern. There's plenty of room to store your gear for the day's excursion. this sweet little kayak weighs only 38lbs. superior tracking and outstanding stability. upgraded Adjustable Ergo Padded backrest and Ergo padded seat. Pelican makes the popular Intrepid 100x as thier top of the 10ft line sit inside kayak. The Intrepid 100x is designed to be more stable, more comfortable AND more durable than other Pelican models. Not all Pelican kayaks are in the Pelican Premium line. and tracking while offering impressive acceleration and speed for its size. a storage platform with mesh deck cover to store your personal items, a smart phone holder and ergonomic carrying handles. it is lighter, stiffer and stronger. Visit our store and we'll get you out on the water in an affordable kayak you'll actually enjoy. • Forward Quick Lock storage hatch. • Center 4" day hatch and storage bag. 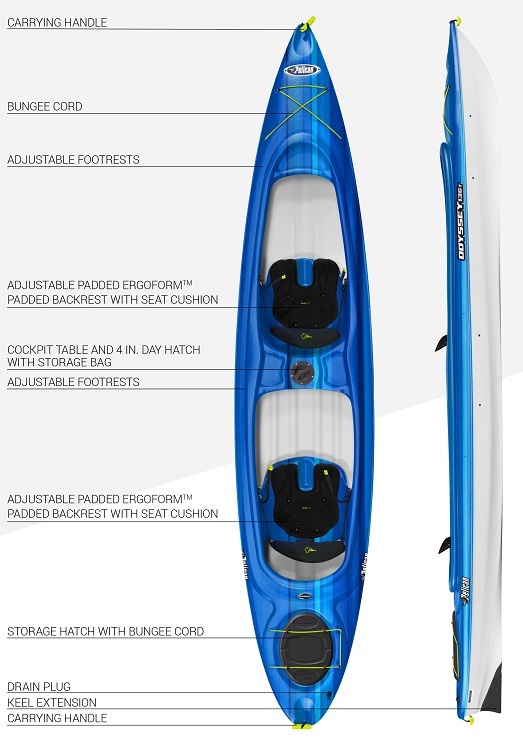 The Strike is an all-new Pelican Premium sit-on-top kayak featuring a wide and stable platform. Check out the newly developed ErgoFlex seating system for All Day Comfort. The Strike has a good tracking hull and moves along easily. It's the best value in its class. 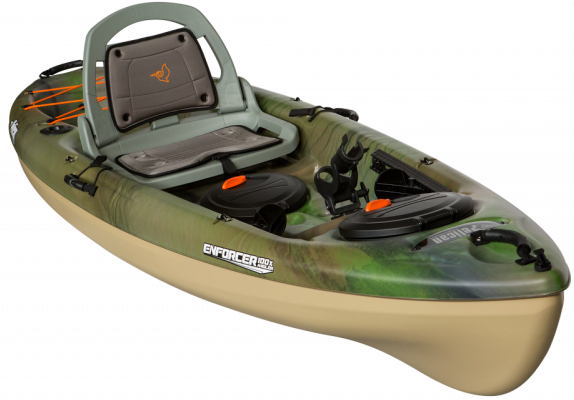 The Strike 100x Angler is an all-new Pelican Premium sit-on-top fishing kayak featuring a wide and stable platform. The Strike 100x Angler has a good tracking hull and moves along easily. Angler features help you stay on the fish all day long. Pelican makes the popular Enforcer 100x as thier top of the 10ft line sit-on-top Angler kayak. The Enforcer 100x Angler is designed to be more stable, more comfortable AND more durable than other Pelican models. The Pelican Premium ENFORCER 100X is a self-bailing fishing kayak engineered for comfort, stability and speed. and to handle any kind of fishing conditions. It offers ample storage for your fishing gear and a large deck space to land larger fish. multiple accessory eyelets and an angler ruler. the Pelican ENFORCER 100X ANGLER is built to last for many kayak tight lined fishing expeditions. 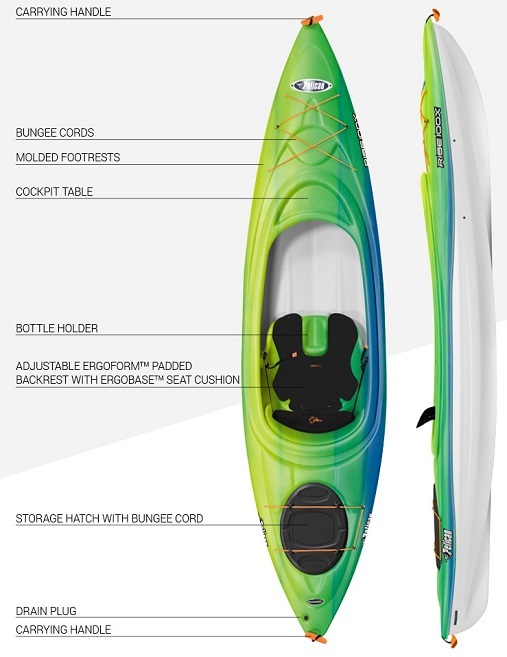 Backed by our limited Lifetime Warranty, it is the perfect all around fishing kayak. 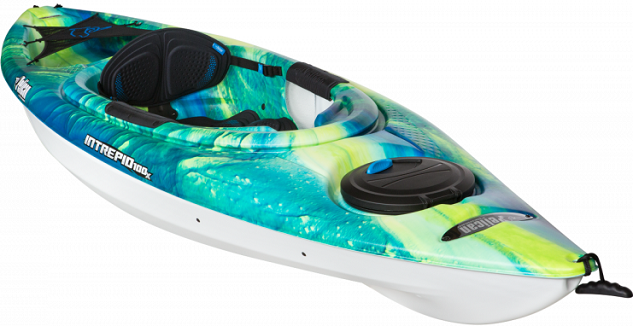 The Catch is an all-new Pelican Premium fishing kayak featuring a wide and flat platform. Check out the newly developed ErgoCast dual position seating system for All Day Comfort. The Catch has a super stable tunnel hull and is the best value in its class. reduced drag and improved cruising speed. adjustable foot pegs and easy-access molded-in cockpit tables. and water bottle holders round out the package.